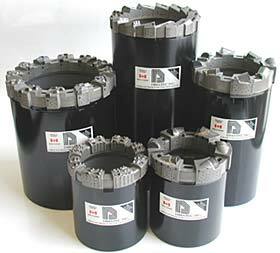 This group of products are similar to surface-set diamond bits in that they are set with a single layer of cutters mounted on the face of the bit in a pre-determined pattern. Instead of natural drill diamond however, the cutting media used on geotechnical bits are synthetic polycrystalline diamond elements. These elements are composed of micron-sized particles of synthetic diamond that have been formed into various geometric shapes. Like surface-set diamond bits, geotechnical bit crowns consist of a tough wear resistant matrix body that as a minimum includes natural diamond gauge protection setting. In most cases, the gauge protection setting is augmented with seismic grade tungsten-carbide pads and/or polycrystalline diamond elements. Shear is the mechanism by which geotechnical bits cut the formation being drilled. In softer formations, these bits are capable of very high rates of penetration when compared to surface-set diamond bits due largely to their high degree of cutter exposure. Geotechnical bits are recommended for use when drilling relatively soft, abrasive, unconsolidated sedimentary formations that are not effectively drilled by surface-set diamond bits. The formation types may range from very soft Clay, Gypsum or Talc to harder types of Sandstone. The difference between the various types of geotechnical bits is in the degree of cutter exposure and the density (or number) of cutters mounted on the face of the bit.